Gokshuru, Guggulu, Shunthi, Maricha, Pippali, Haritaki, Vibheetaki, Amalaki and Mustaka. Processed in: Erand oil. 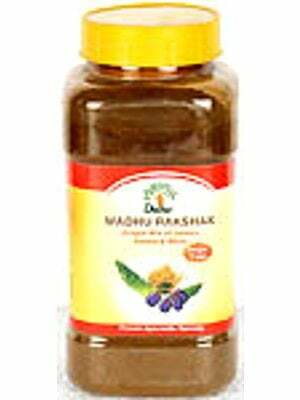 Uses: This is beneficial in Diabetes, Painful Urination Urine Retention, Renal Stones. Metrorrhagia, Gout, Seminal disorders and diseases associated with Urinary Bladder. This is very useful in Spermatorrhoea and Oligospermia. It improves sperm count when taken with cow’s milk. This medicine is also an aphrodisiac and rejuvenator. Dose: 2 tablets (500 mg) two to three times a day or as directed by the physician.